Gears of Halo - Video game reviews, news and cosplay : What's in the Halo 4 Limited Edition? Available for preorder today, the Halo 4 Limited Edition maximizes your multiplayer experience and puts you in the boots of a Spartan-IV aboard the UNSC Infinity - the hub of your Halo multiplayer career. The competitive multiplayer modes of Halo 4 are known as War Games. The Limited Edition includes access to nine maps - three future competitive multiplayer map packs, each including three locations, available for download post-launch on Xbox LIVE. Yes, you read that correctly; you get nine maps in the form of future DLC with the purchase of the Halo 4 Limited Edition. Score! 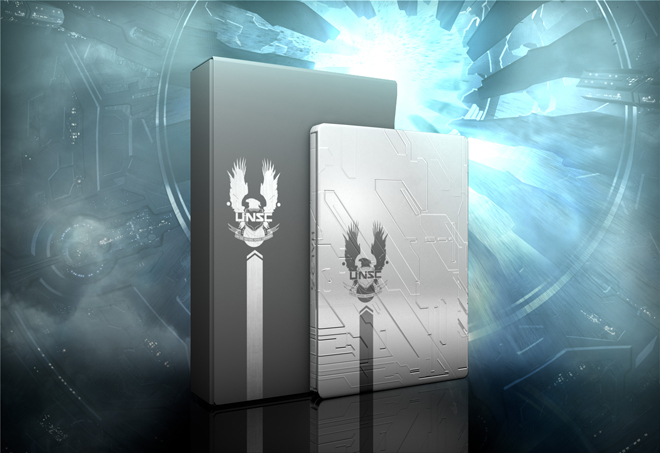 Everyone will have access to select Specializations, but those that purchase the Halo 4 Limited Edition will receive the ability to unlock six Specializations early, available at launch on Xbox LIVE. You can use them, one at a time, to achieve higher ranks in your Spartan career. In addition to gaining access to new ranks, Specializations unlock new customization options. We'll be releasing more information about Specializations at E3, so expect additional details about this particular feature then. The UNSC Infinity Briefing Packet includes a Spartan armor customization schematic, information about UNSC weapons, an introduction to the massive ship UNSC Infinity, and insight into what it means to be one of humanity's finest warriors: The Spartan-IVs. Story lovers will especially enjoy this in-fiction offering that provides a glimpse into the indoctrination of Spartans aboard the Infinity. The Special Edition of Halo 4: Forward Unto Dawn is a 90-minute extended version of the live-action digital series which will take fans back to the terrifying beginning of the Human/Covenant war, when the Master Chief inspired a young cadet who would eventually become a leader aboard the UNSC's greatest vessel ever: the UNSC Infinity. Digital content also includes in-fiction bonus content that expands the characters and stories of Halo 4: Forward Unto Dawn, special featurette Bringing Gaming into Reality, and a behind the scenes look at the making of Halo 4: Forward Unto Dawn. The Limited Edition includes the following bonus digital content through Xbox LIVE: unique in-game Spartan-IV armor skin, unique in-game weapon skin for the Assault Rifle, an exclusive in-game emblem, Xbox LIVE Avatar prop, and Xbox LIVE Avatar Spartan IV armor set. "Right about now you may be wondering, "If all those things come with the Limited Edition, what are they going to put in the Legendary Edition?" Here is the answer to that question: There will be two options available at retail for Halo 4 - the regular version of the game and the aforementioned Limited Edition. We decided to focus our efforts on a single special edition instead of numerous ones so you wouldn't have to pick and choose between what ancillary items you want. Now your primary choice is whether or not you just want the game, or the game along with all the goodies. And we're hoping we made that decision an easy one for you..."
You read this far? You wants? Then pre-order the Halo 4 Limited Edition from Amazon.